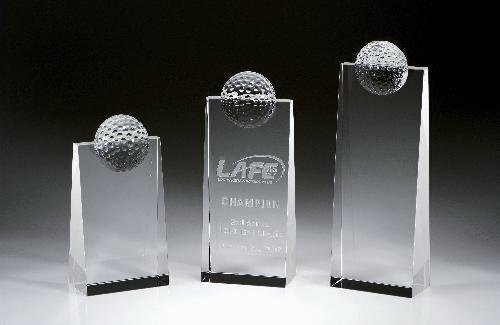 Our Golf Glass and Crystal awards collection contains awards specific to one of todays most popular sports. 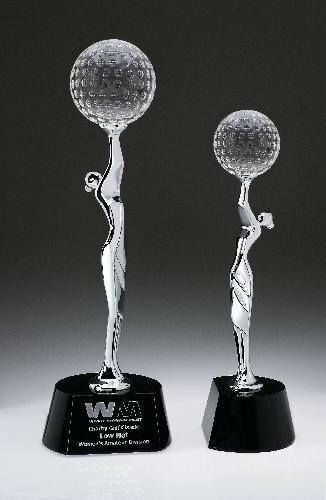 Golf award presentations with glass and crystal awards are very traditional for all golf clubs around the world. Virtuoso has a sharp, clean and prestigious look with the silver metal goddess holding a golf ball up high. Price includes sand etching of up to 6 lines of text. Add this item to your shopping cart to enter your personalization text and upload logos and other files. We will send a proof for approval before engraving. You must respond within 24 hours to avoid delays in production time. Logos, photos and graphics are additional, and can be uploaded during checkout. The Winning Golf Tower has a large engraving area and is budget friendly. Simple and bold to celebrate winning golfers.